Sage CRM offers a broad range of typical tools: mobile interface, customer service, help desk, social CRM, sales, and marketing automation, helping you optimize the customer experience, increase company revenue and reduce any inefficiencies. The web-based interface offers tabs and navigation menus, and you can choose if you prefer a classic or interactive highly customizable dashboard. Campaign management feature is rich and well deployed: you’ll easily create, track and manage every campaign. Reports and analysis are extremely thorough, helping you monitor leads. Unfortunately, Sage CRM doesn’t allow you to track your competitors’ information, an essential feature to automate sales process. Talking about tool deficiencies, Sage CRM offers limited integration options: the only possible email integration is Outlook. Sage CRM also lacks a batch deletion tool: you have to delete manually multiple records, and it means a significant waste of time. Sage CRM support is available via phone (from 6:00 a.m. to 5:00 p.m. PT, Monday through Friday), email, web, and live chat. Remote diagnostic support is available with a 48-hour response time for a limited number of cases, but if you need more, you can subscribe the gold support plan. Sage CRM pricing plans are among the most cost-effective out there, starting from $45 per user per month. A 30-days free trial is available, no credit card required. Low costs make Sage CRM affordable for smaller businesses. It’s a great choice if you need easy-to-use tools and high customization, but the service lacks integration features. The app must be more scalable. Lacks integration and competitor tracking tools. 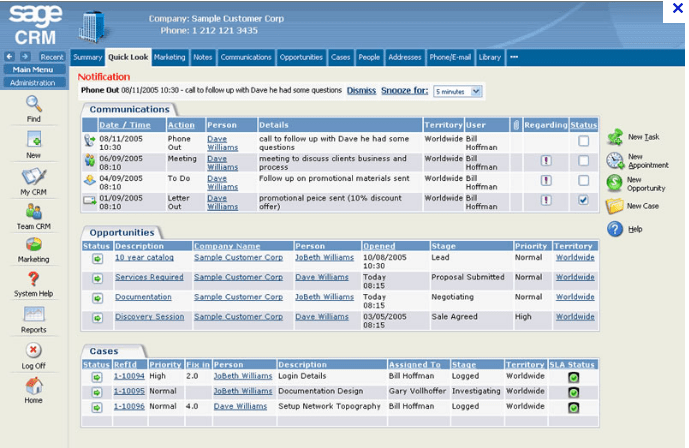 Sage CRM offers two pricing plans. A 30-days free trial is available.